Aulus Metellus also known as the Orator is the type of statue that might have been found on the top monument, or a column as some sort of memorial to the person. In Roman times his pose would be considered to have been one of persuasiveness, one of an authority, one of someone who was scholarly. This statue also wears his name on the hem of his clothing. 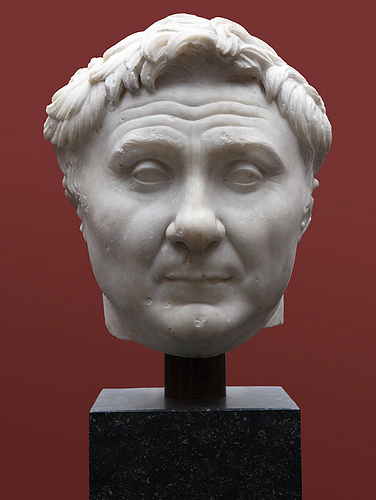 This is a portraiture of General Pompey, one of a 3 man team who rule Rome from 60 B.C.E. to 53 B.C.E. The realism in this portrait is very evident in his face. His wrinkled forehead, chubby face, and tiny eyes show attention to detail. You can even see warts that were on his face. This kind of detail would be referred to as verasm. Julius Caesar had himself on silver coins. Even on these small coins realism and portraiture were done very well. You can see the detail of his age in his features and even in his hair that is starting to bald. Caesar used these tiny portraits as a propaganda to remind the Roman citizens of what he had done for them. On the other side of the coin is the goddess Venus. Caesar claimed that he was descendant of this Goddess through a mortal son that she had named Aenas. This tradition of propaganda through coinage would continue throughout his successors. This would typically consist of a portrait of the leader on one side and then a symbol of the why he was worthy. This could be an event that happened, or an action he took for the good of the country. Roman coins have given historians a person view on Roman history.